A blepharoplasty is an operation to tighten the skin and soft tissues of your eyelids. As you get older your skin becomes less elastic. Gravity pulls down on the skin and soft tissues of your eyelids. A blepharoplasty can be done under a local anaesthetic injected into the eyelids or under general anaesthetic. The operation take up to an hour and a half. Your surgeon will make a cut in the natural skin crease of your upper eyelid or below your eyelashes in your lower lid. They will remove any excess skin and fat and close the wound using very fine stitches. If you have local anaesthetic you should be able to go home a few hours after the operation. If you have general anaesthetic you will need to wait until all the affects have worn off. You may need pain relief when the anaesthetic wears off. You may experience swelling and bruising following this procedure. To control this your surgeon may recommend using cold compresses. Be sure and discuss how to do this with your surgeon. Other symptoms you might experience are dry or itchy eyes, temporary sensitivity to light or wind, watery eyes and blurred vision. Some patients experience blurred vision. This should improve after a few days. Do not drive until your vision is totally clear. The bruising and swelling can get worse during the first and second day after surgery. The black eyes may make you look pretty bad at first. However, the bruising and swelling begin to disappear rapidly after this time, with bruising turning yellowish after ten to fourteen days. Make up can be applied from about five days after surgery and most people feel confident enough to return to normal activities (and back to work) after 10 to 20 days. Impact exercise is best avoided in the first month. Contact lenses should not be worn for two weeks after surgery. Avoid applying eye make up on the day you have your stitches removed. THE BELOW IS ONLY A GUIDE AS TO THE STAGES OF BLEPHAROPLASTY RECOVERY. EVERYONE HEALS DIFFERENTLY SO YOUR RESULTS MAY VARY. Will I need further treatment to maintain results? Less than 4 in 100 people need to have another blepharoplasty (revision surgery) to produce a satisfactory result. The results of a blepharoplasty can last 5 to 10 years and in some cases are permanent. Naturally, your face will continue to age, but should always appear younger than if you had not had the procedure. Your surgeon may be able to assess you for laser skin resurfacing, where a laser is used to gently burn the surface of the skin. New, softer and less-wrinkled skin heals in its place. The effect is not permanent and the procedure is not usually suitable if you have dark skin. Injecting muscle relaxants can smoothen fine wrinkles around the eyes. 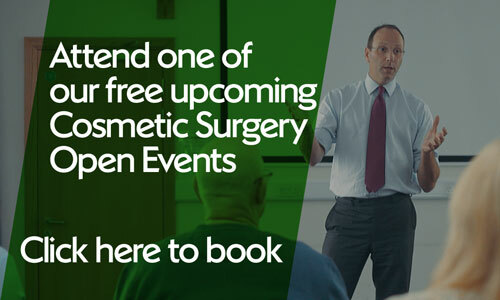 Choosing the right consultant is an important part of the process; Find out more about Nuffield Health’s registered cosmetic surgeons. So that you know exactly what to expect from the results of this surgery, we encourage you to share your expectations with your consultant as early as possible. This should help you to establish a clear indication of what is realistically achievable with this procedure. We will never pressure you to make a decision. To give yourself time to decide what’s right for you, we recommend you leave at least 2 weeks between your consultation and booking your surgery. We strive to make sure that you’re completely satisfied with the treatment and care you receive. If you do have any complaints post-surgery, you can send them to us via our clinical complaints form.